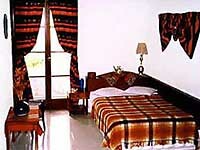 For more Aegean Thesaurus Travel accommodation options in Crete click on the "Hotels" link above. Conveniently located on the edge of the historical seaside village of Maleme, The Summer Lodge, is an attractive, family run vacation lodging and a fine example of traditional Greek architecture. Only 5 Km from the center of Platanias and 16 Km west of Chania town, it is the ideal starting point for the visitors requiring a wide variety of sandy beaches, water sport activities, peaceful countryside walks, or interesting visits in archeological and historical sites. The Summer Lodge is set around a pretty, flower filled courtyard and orange grove; the house has a total of 17 well-furnished and nicely decorated rooms. They all have en suite shower rooms, WC and wash hand basin and are equipped with fridge and safe box. Most of the rooms have private balconies or open terraces whilst others on the ground floor, that face onto the gardens, have a patio area and are particularly cool in the heat of the summer. With the tremendous advantage of being no more than 400 meters by footpath to the long, quiet beach of Maleme, mostly sandy but also pebbly and a number of nearby tavernas as well as a supermarket, the location of the Summer Lodge couldn't be more convenient. Car hire, although useful, is not essential. The superb 10m x 5m pool is surrounded by sun terraces and is supplied with patio furniture and sun lounges. Beyond the pool and shaded by willow trees is a pretty terrace where breakfast is served any time you please and a small bar serving cool drinks in the hot summer evenings. Personal service, relaxing atmosphere and a warm welcome await you at the family run Summer Lodge, a charming property, and ideal for both families and couples. Amusement Water Park, local festivals & live music, historical interests, sandy beaches, nature-picnic area, lake & national parks, antique shopping, museums & art galleries, traditional cuisine & fine dining. Swimming & water sports, fishing & diving, windsurfing & boat tours, mini golf, hiking trails, sight seeing tours, tennis courts, horseback riding, bird watching and mountain biking.